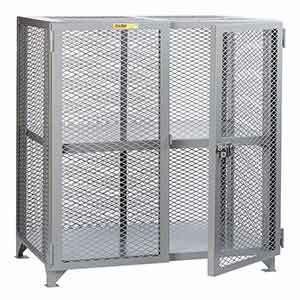 Built from heavy gauge flattened steel mesh, sheet metal shelving, and a welded angle frame, this cabinet provides dependable security for loads up to 2,000 lbs. The 3/4" x 1-3/4" openings in the mesh allow visibility yet are small enough to deter pilferage. Double doors swing 270° outward for complete access and close tight with a lockable slide latch (padlock not included). The center shelf can be adjusted on 3-1/2" centers or removed entirely when you need to store bulkier items, and the cabinet can be bolted to the floor through lag holes in the feet. Shelf D x W: 30" x 48"